Rubber Room Ramblings: CAROLINE'S BECAUSE I CARE! This is the card that Caroline shared with us on Wednesday at our demonstrator get together. She showed us an awesome technique that I can't wait to share with my customers, so this is another card from our demonstrator group that I will be making in my upcoming workshops, clubs, and/or new catalog open house. For this card we used the Because I Care Level One Hostess Stamp Set. This is such a beautiful flower, and the best part about this stamp set is that it is FREE with any qualifying workshop/club order! Schedule your workshop with me, and I will show you just how easy it is to receive this stamp set for FREE! For this card we used the new Marina Mist cardstock, along with Basic Gray and Whisper White cardstock. We also used Certainly Celery and Marine Mist classic ink pads, and a Blender Pen. 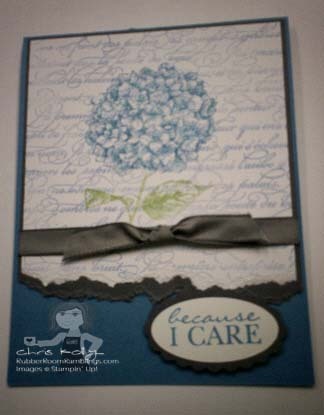 The sentiment is from the Because I Care stamp set, and we stamped it in Marina Mist classic ink and then punched it out with the large oval punch and layered it onto a Basic Gray piece of cardstock punched with the Scallop Oval Punch. Then we added a Basic Gray Taffeta Ribbon to finish it off. Thanks so much, Caroline, for your creative inspiration! WORD PLAY FOR THE HOLIDAYS! COLOR CHART FOR COLOR CRUSH PARTY! A JOB WITH STAMPIN' UP! IS WAY TOO FUN!! JUST ANNOUNCED AWESOME NEW HOSTESS SPECIAL! STAMPIN' UP! PERFECT PUNCHES IN BLUSHING BRIDE! STAMPIN' UP! PERFECT PUNCHES FOR THE HOLIDAYS! STAMPIN' UP! WATERCOLORED PEACE WITHIN! STAMPIN' UP! BIG SHOT BASKETS AND BLOOMS DIE! HUGE RUBBER STAMP SALE HAPPENING SOON! STAMPIN' UP! VINTAGE WALLPAPER EMBOSSING FOLDER! MICHELLE'S MARVELOUS MY DIGITAL STUDIO CARDS! NEW COLOR KITS BEING OFFERED! MY FIRST EVER VIDEO FOR MY BLOG! PRESTO PATTERN PAPERS AND BECAUSE I CARE! KERI'S ON BOARD BRIEFCASE FROM STAMPIN' UP! BIG SHOT VINTAGE WALLPAPER EMBOSSING FOLDER! CALLING ALL RETIRED STAMPIN' UP! DEMONSTRATORS! WELLNESS WISHES TISSUE HOLDER PATTERN!